Stand-in buildings show what a finished street might look like in downtown Stockton. Making the building flats for Stockton (April 8 Post) started the city on its way to looking like a city. The unfortunate thing was that several of the streets ended at the backdrop and the result was not particularly realistic. 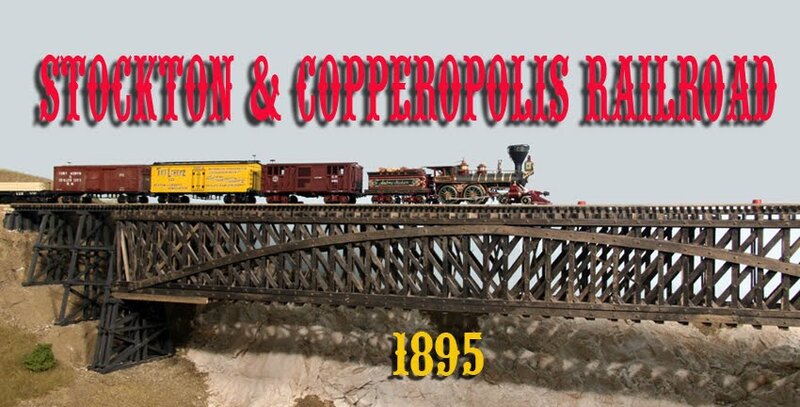 I have seen other modelers use real photographs glued to the backdrop to make it look like the road continued but the only photographs I have of 1890s Stockton are in black-and-white. Since Stockton's nineteenth century buildings are mostly gone, I decided to try colorizing some of the monochromatic photos I have. Knowing nothing about colorization, I googled the process and found it to be rather straight-forward but a little tedious. Using Adobe Photoshop, I started adding colors and, a few hours later, had a reasonable-looking color street scene. After printing out a picture which appeared to be about the right size, I pasted it to the backdrop and the result is above. 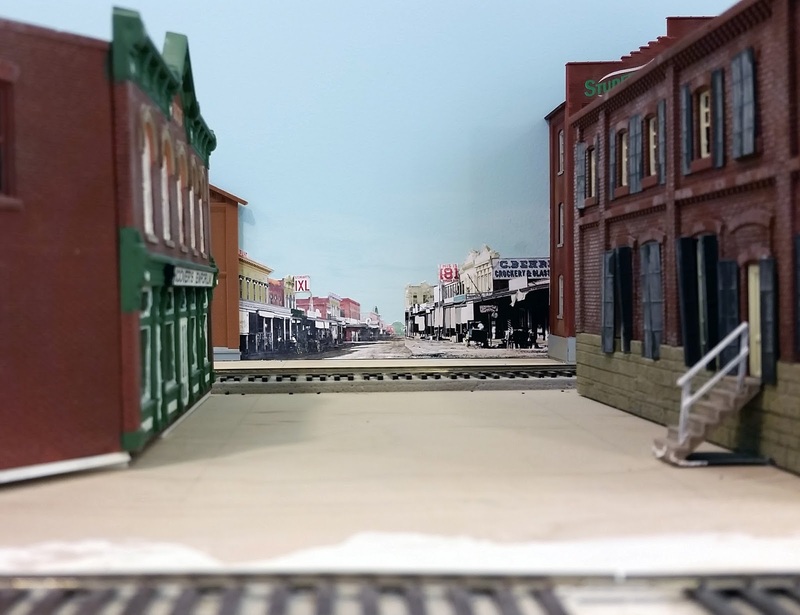 I needed at least one other photo but the bulk of my street scenes did not have the photographer standing in the middle of the street producing the right view for railroad modelers a century later. I did, however, have scenes of two separate streets which I thought could be combined, again using Photoshop. Once the two scenes were joined, I colorized the picture and the result is below. This street scene was made by combining shots from two separate streets and joining them in Photoshop. I was pleased with these first attempts and am looking forward to completing the street, adding structures and a few vehicles. I think Stockton will start looking more like a big city. The entire set of flats I constructed stretches about six feet along the backdrop at Stockton. The depressed area at the right will be a marsh. The two gaps in the flats are for Centre Street (at left) and Commerce Street. 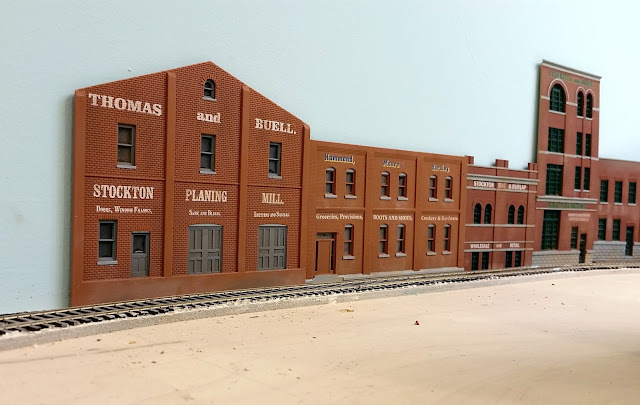 A few of my regular operators have told me that they would like to see some progress on structures at Stockton (it only had the two-stall roundhouse and an open-air warehouse for the steamer line). I decided to respond to their wishes and also get some kits out of their boxes. 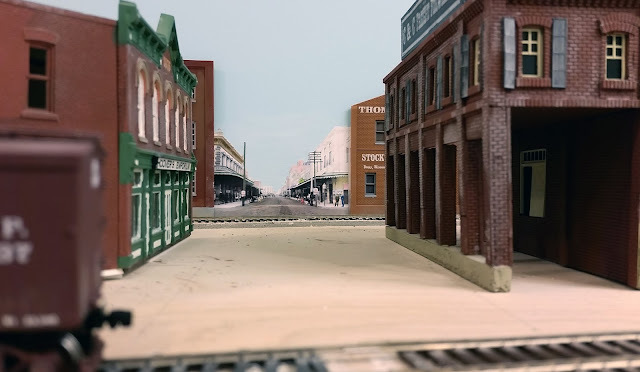 Using some of the Walthers building flats and a couple of parts from another kit, I came up with several distinct businesses, all of which existed in Stockton near the railroad. 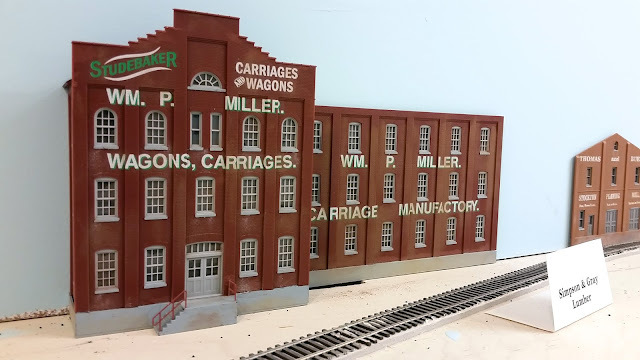 The far right of the flats is the Pacific Tannery, one of the online shippers on the railroad. The two buildings to the left are Sylvester and Moye, furniture makers and Stockton Bags and Burlap. The next buildings are Hammond, Moore and Yardley, grocery and provision sales and Thomas and Buell of the Stockton Planing Mill. Wm. P. Miller sits between Centre and Commerce Streets. They were a big manufacturer of wagons and carriages. They weren't quite as well-known as Henderson but I liked the lettering on their building better. To the left of Centre Street is the Stockton Glass Factory. Now I have to figure out what to do about the "continuation" of the streets into the backdrop. I have a couple of ideas which I hope to share once I perfect them.